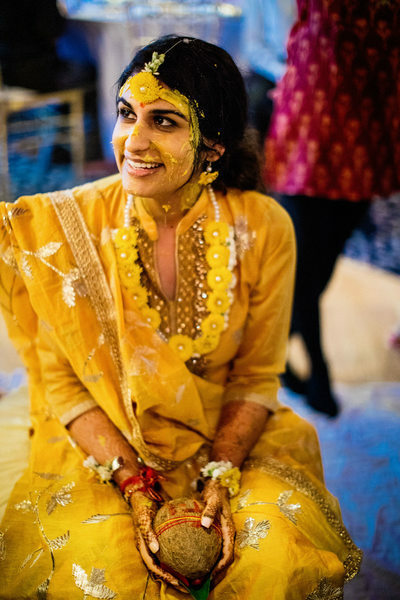 Last May, I had the privilege of photographing Sawina and Karan’s indian wedding in Pittsburgh. The festivities started on Thursday, when I photographed the Mehendi night at the bride’s residency. Sanju, from Diva Mehendi Arts, did the bride’s beautiful henna. At sunset, we ventured outside to get some creative wedding pictures; the couple brought smoke photobombs, which created a magical landscape of color. 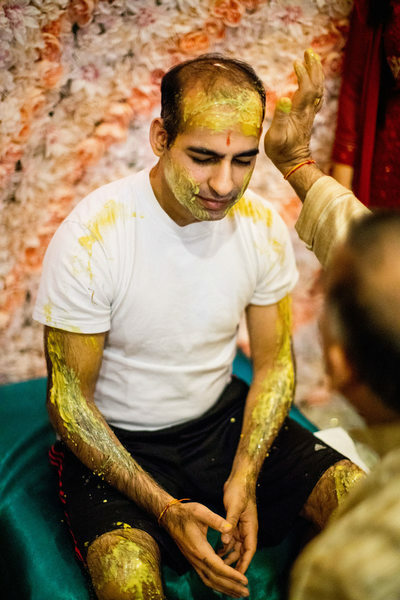 On Friday Morning, I photographed the bride and groom’s Haldi ceremony. Both ceremonies were at the same venue, which allowed me to go back and forth between the two of them. In the evening, we met again at the Rivers Casino, with was stunningly decorated by Modern Affairs. 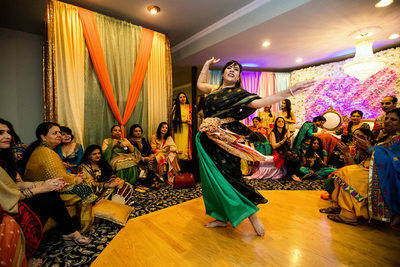 During, the sangeet, family and friends got to perform for the the bride and groom on an incredible, one-of-a-kind floor of swirling color. Karan and Sawina also performed for each other in elaborate, beautifully choreographed dance. On Saturday, we started photographing the bride’s preparations at sunrise. Jasmina Mann was already finishing with Sawina’s makeup when we arrived. We photographed the bride and groom’s details and got ready for the first look. Initially we planned on doing it outside, but right when we stepped out it started raining. Plan B was the Omni William Penn’s lobby. I always enjoy photographing weddings at the Omni William Penn Hotel because it offers countless opportunities for photos while always providing a royal backdrop. The bride and groom looked absolutely regal, and I loved positioning them around the luxurious fixtures at the Omni. 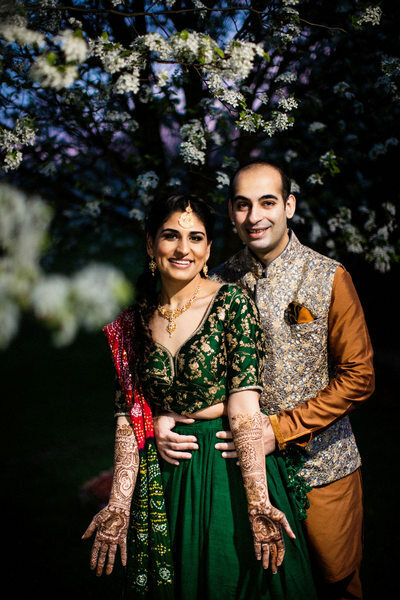 After the first look and bridal party portraits, we photographed Karan’s Sehra Bandi ceremony. 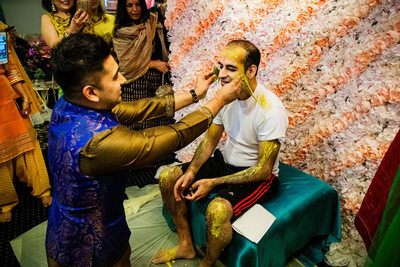 In this ceremony, the groom is dressed in a traditional Sehra, which veils his face just like the bride’s veil, and adds an element of mystery to the ceremony. 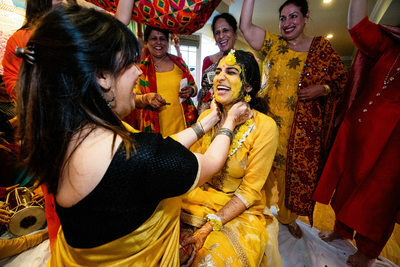 Elisa, my associate photographer, photographed Sawina’s chooda and kalire ritual with her bridesmaids. It stopped raining for Karan’s baraat in Mellon Square. Friends and family of the groom’s side celebrated the arrival of the groom to the ceremony site and were warmly welcomed by the bride’s closest family. The families exchanged garlands and played games. 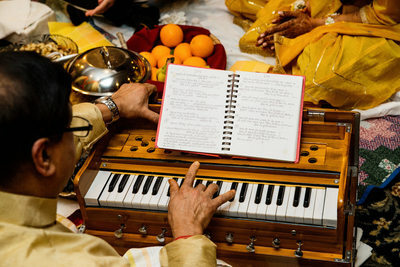 The indian wedding ceremony took place in the Urban Room, perfectly decorated by Modern Affairs. The wedding day culminated in the main ballroom, which Modern Affairs turned into a perfect spring blush dreamscape. Congratulations to the newlyweds!